Health Literacy Month was founded by Helen Osborne, M.Ed, OTR/L as a way to raise awareness for health literacy issues in 1999. This year’s theme is “Be a Health Literacy Hero.” You learn more about current “heroes” and nominate your own by visiting Helen’s site. Health illiteracy is a widespread issue in America. The effects of health illiteracy are felt on a personal, community-wide, and national level. 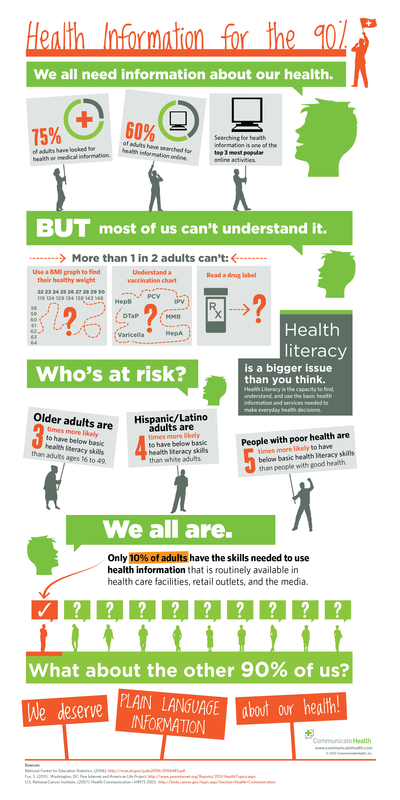 It is estimated that low levels of health literacy costs the U.S. economy up to $236 billion each year.1 Raising health literacy levels is a goal of many organizations throughout the national. The U.S. Department of Health and Human Services began its Healthy People 2020 campaign in 2010. Healthy People 2020 provides “science-based, 10-year national objectives for improving the health of all Americans.”2 Healthy People 2020 strives not only to improve general health status of the U.S. population, but also focuses on disparities and inequality in access to healthcare. In addition to the Healthy People campaign, community based organizations throughout the nation work to improve health literacy. The CDC currently lists organizations which are working to promote Health Literacy by state. These organizations’ goals must be in line with the National Action Plan to Improve Health Literacy. You may learn about each program by clicking on the program name in the list. Florida Literacy Coalition (FLC) is proud to partner with Florida Blue to make available targeted grants to promote health literacy. The goal is to provide health-education resources for local adult English for Speakers of Other Languages (ESOL) and family literacy programs so that students in these programs can make informed choices about their health and nutrition. The FLC has also offers a range of health literacy publications. Our publications include the Staying Healthy and Staying Healthy for Beginners books which you can download for free in PDF format or order hardcopies by clicking here. Companion videos are also available. This entry was posted in Uncategorized by Florida Literacy Coalition. Bookmark the permalink.